Shrubs can occupy large areas within a landscape and provide the mass needed to anchor a landscape design. The large size and shape also work to smooth the transition between taller trees and lower growing perennials. Beyond the usual landscape application, native shrubs are an enriching force and resource in the landscape, contributing countless benefits in food and habitat for birds, pollinators and caterpillars. In the fall, you’ll enjoy the show of bright colors and berries that are a highlight of the season. Native shrubs are easy to grow and often tolerate a wide range of conditions. Our website lists the preferred growing conditions for each species, including soil type, soil moisture, and light requirements, to help you choose the shrubs that are best suited to your location. 1. If the potted shrub has dried out, saturate the potted plant with water. Water it thoroughly a couple of times and then let it sit for an hour or so before planting. Pre-watering helps expand and wake up the roots, making them ready to receive moisture from the soil. 2. Shrubs need to be planted (spaced) to allow for their mature width. 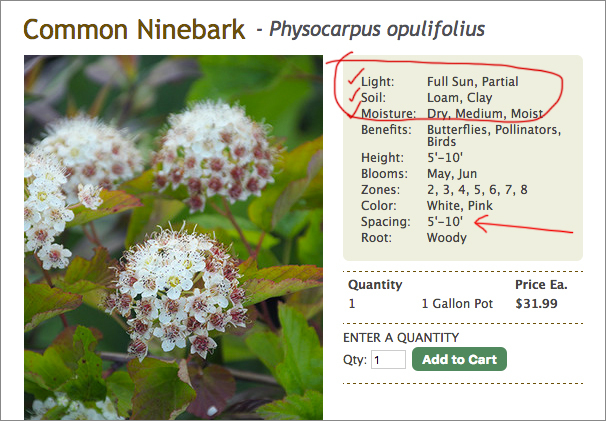 The spacing for each shrub species is listed on our website. Place the potted shrubs on the ground where you intend to plant them. Use a tape measure to measure from the center of one plant to the center of the next to get the desired spacing. Initially, when you are siting them, and when you first plant them, they can look a little bit “lost in space.” You’ll need to use your imagination a little, and trust that they will grow up and fit beautifully in the landscape! It will happen. If you are planting a hedgerow and desire a solid mass of shrubs, space them closer, or at the lower end of the spacing range. 3. Dig a hole 2 – 3 times the width of the pot and at least as deep as the pot, or a couple of inches deeper. 4. Remove the shrub from its pot. 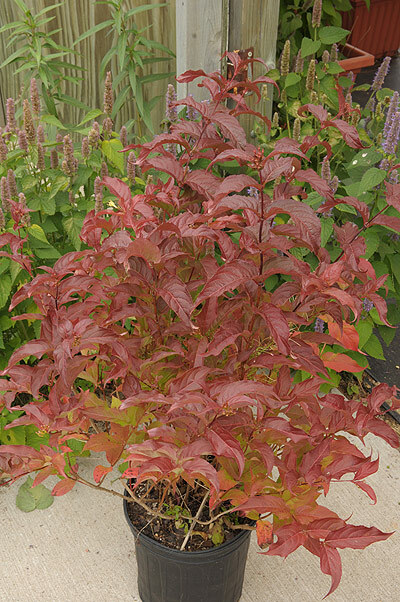 Before planting it, loosen the roots of the shrub. Tease the outer roots from the soil. If the roots are tightly matted, use a knife to score the root mass in several places and gently loosen the root ball. This won’t harm the plant. It will stop the roots from wrapping around, and helps them move out into the surrounding soil. 5. Set the readied plant into the hole to test its depth. The top of the potted shrub’s soil should be AT ground level – NOT above ground level. Make any necessary adjustments at this point, either removing some soil or adding a little back in, to achieve the right planting depth. 6. Check the shrub orientation for aesthetics and positioning. Once you have the shrub positioned the way you want it, pull some of the dirt back into the hole and around the shrub for stability, filling the hole about halfway. Pack the soil down by hand. Check the shrub position again, making sure the plant is vertical. Adjust if needed. 7. Add water at this point, soaking the shrub and filling the whole with water. After the water has soaked back into the soil, fill the rest of the hole with dirt up to level with the surrounding ground. Pack the dirt around the plant again, just enough to remove any air holes. Water thoroughly, again, once you are finished planting. Mulch. Newly planted shrubs will benefit from a layer of mulch to help conserve water in the disturbed, bared ground. Add 2 – 3 inches of the mulch of your choice after planting. Make sure to taper the amount of mulch inward, toward the plant stem – avoid mulching right up to the base/stem of the shrub. After your native shrubs are well established (a full year), there is no need to continue mulching them with anything other than leaves or grass clippings. They will fare just as well, and contribute to more biodiversity if the ground around them contains local spent plant material or a ground cover of other plants, rather than a mulch covering. Water. Newly planted shrubs need to be watered regularly. If you are planting in fall, check the soil around the shrub regularly and make sure that it is not drying out while the plant still has leaves. Water as needed. If you plant shrubs in the spring or summer make sure to set and follow a regular watering pattern for the entire season, and keep them adequately watered. Properly sited, your native shrubs should not need additional watering once they are established (a full year), except during extremely dry or drought conditions. Pruning. 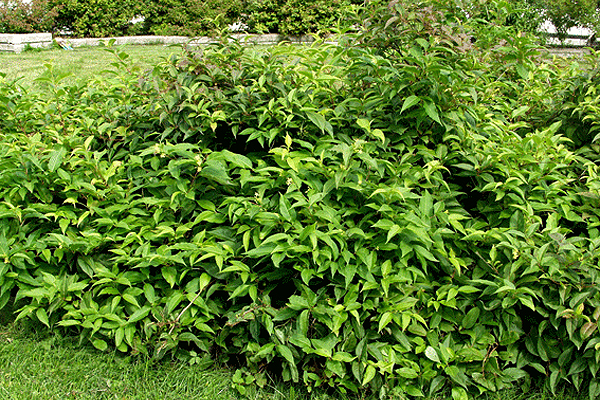 Avoid pruning your newly planted shrubs – just let them grow and become established, for period. The shrubs that we sell are usually in one and two gallon pots, so it’s best to allow at least three years of growth before pruning anything, if deemed necessary. If you’ve planted a hedgerow, avoid pruning heavily in the spring when birds are likely to be nesting in the shrubs.